There was something about trees. My discovery started when I was about twelve, maybe thirteen and I wrote a poem about them when I wondered about my place in this world. "To A Tree" revealed my earliest connections to finding a good place to be. I was on my way to self-discovery. But there was a particular tree that I would greet when leaving my home and upon my return, noticing its slender leaves waving hello in the slightest of breezes. My tree, a birch, not only became my buddy but also synonymous with home. Over ten years ago I wrote the first draft of Under the Birch Tree, a memoir of discovering connections and finding home. My earliest memories of my birch buddy were my inspiration behind writing this book. Under the Birch Tree by Nancy Chadwick is an insightful and thought-provoking memoir that speaks about the insecurities of life, the connections and disconnections in relationships and jobs, and the profundities and inner meanings of everybody’s lives. 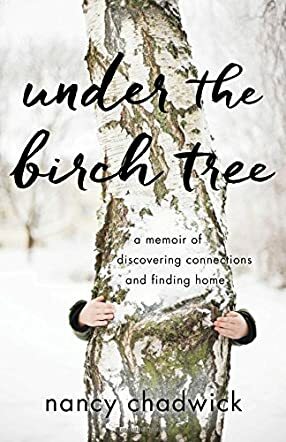 She begins the book with her childhood days and playing in the back yard, and how she forms a connection with the birch tree that grows in the front yard of her childhood home. Her birch buddy is synonymous with home and the author aesthetically links birches, their struggle to survive, and how their shallow roots test the soil, grow, and finally mature to that of her struggles, and finding her ground while branching out. Her discovery that there is something about trees, how they become a metaphor for living, and a guiding symbol for finding home is what makes the memoir and the author’s words form a connection with readers. The author’s uplifting encounters with birch trees will leave readers motivated to have a different perception of life, and will enable them to handle the triumphs and tragedies of life in a contented way. Reading this book is empowering as it is about survival, faith, and perseverance. The spirit of the birch tree runs through the memoir - convincingly, powerfully, and with intensity - and gives a sense of calmness, grounding, and centeredness to readers. This memoir is about finding home and will touch readers in many ways. The author’s self-discovery, her sense of belonging, and struggles with life are real and can be related to well by readers.